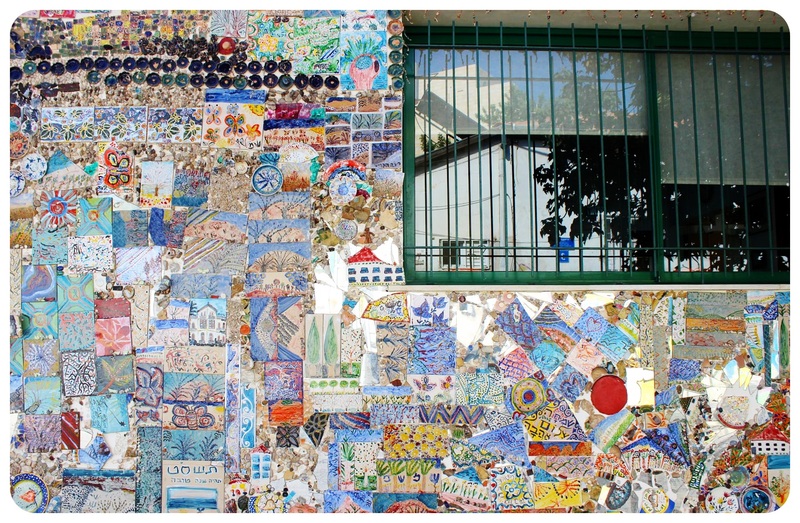 My love affair with Tel Aviv was short, yet passionate. It was like the perfect summer fling; an intense few days – intense because you know it will come to an end soon and you want to savor every precious moment to the max. However, when I arrived in Tel Aviv, I didn’t think I would end up leaving this city with a heavy heart. I like pretty cities – when a city is obviously beautiful like Antigua, Paris or Buenos Aires, I tend to fall in love quickly. With cities that aren’t as pretty at first sight, like Berlin or Bangkok, it usually takes me a while. Tel Aviv belonged to the second category, visually not particularly appealing at first, even feeling a little gritty in some parts. It took me a few days of wandering the streets, but then, completely unexpected, the city put a spell on me and grabbed me hard, pulled me into its fascinating mix of old-fashioned markets and trendy coffee shops, coexisting cultures of trendy hipsters, Jewish families and Arab Muslims; a city with a delicious food scene, buzzing nightlife and gorgeous beaches right at your doorstep. 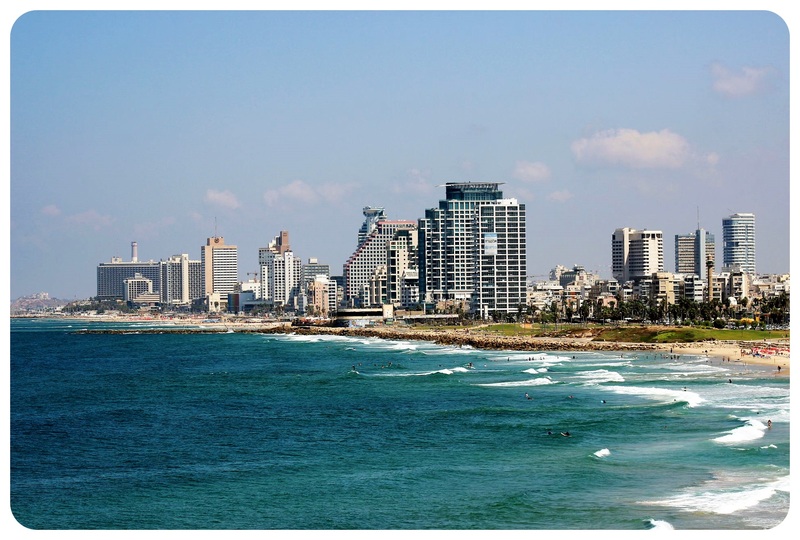 Tel Aviv took hold of me and hasn’t let me go since: while I travel to a lot of places that I’d like to return to, I don’t often travel to places I’d like to live in. 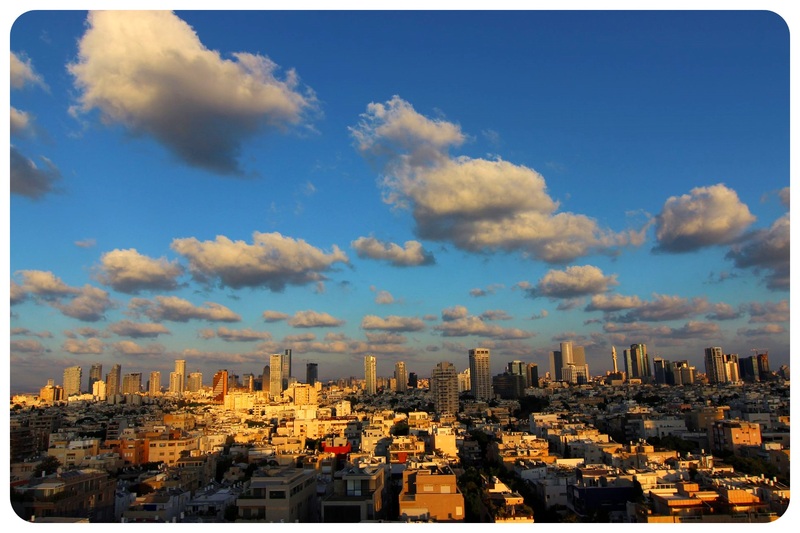 Tel Aviv is one such place though – I would love to live there for a while, taking my time to truly explore the city, understand its culture, its people and as a foodie: have enough time to delve into the cafe and restaurant scene, of which I only scratched the surface. 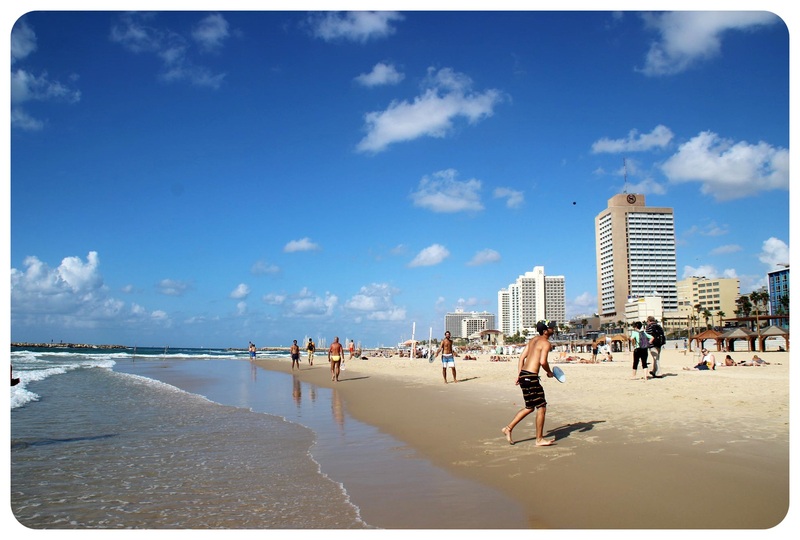 I am not sure what exactly it was that made me fall for the city – it might have been the beach, which is without a doubt part of the draw of Tel Aviv, nearly nine miles (14km) of wide sandy beaches right in the city center. There are just not that many cities in the world that have such a prime oceanfront location. 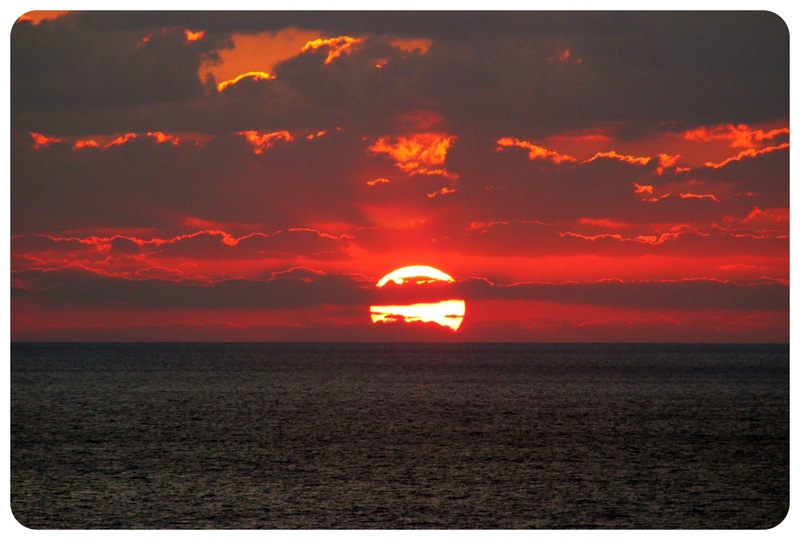 I would either start my days with a run along the Hatayelet, the promenade, or finish my day with a sunset run while the sun colored the sea and the sky with striking tones of orange, red and purple. A daily spectacle that draws hundreds of people to come out to the beach and watch it. I would never get tired of it. The local runners I passed on my runs usually looked as if they had fallen right out of a men’s magazine, wearing nothing but shorts and showing off their perfect abs, covered in a layer of sweat. I would run by the gay beach, where couples sat together all loved up, and of course I have to love a city that has its own gay beach (even though I loved other parts, such as Gordon, Frishman or Banana Beach, just as much) – in the Middle East no less! I loved the active vibe along the beaches – no matter if it was running, cycling, inline skating, kite boarding or the popular matkot ball game, people were doing some kind of activity. 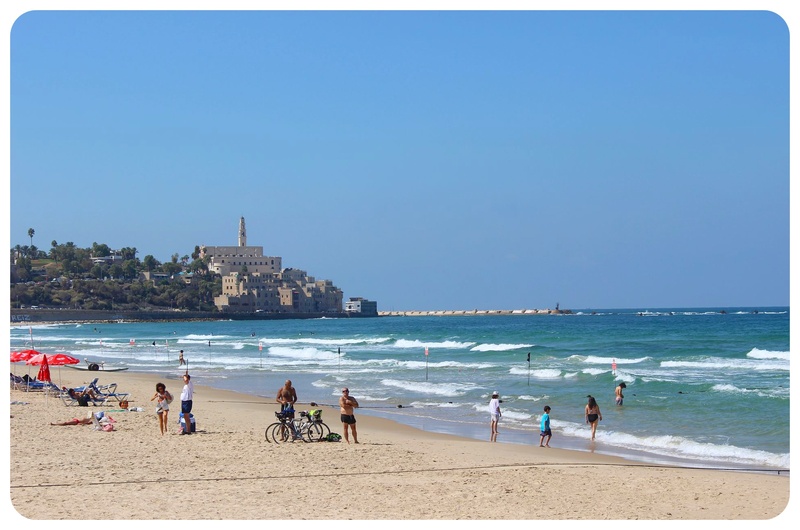 In all honesty, my daily runs were needed to offset all the delicious food I stuffed myself with, but Tel Aviv just seems to be an active city – and with a gorgeous backdrop like these beaches you don’t need an excuse to go outside and exercise. I was staying close to El Carmel market, the main market of Tel Aviv, and so I would make it a daily ritual to stroll through the market when I started my wanderings around the city, always unable to resist a piece of fresh bread or baklava, which I would devour with a cup of strong coffee in one of the many cafés that you stumble across on every corner. El Carmel was priceless for people watching: here, you see hipsters mingle with traditional Muslim women and Jewish families, all stopping for a chat with other shoppers and with the vendors they buy from regularly. 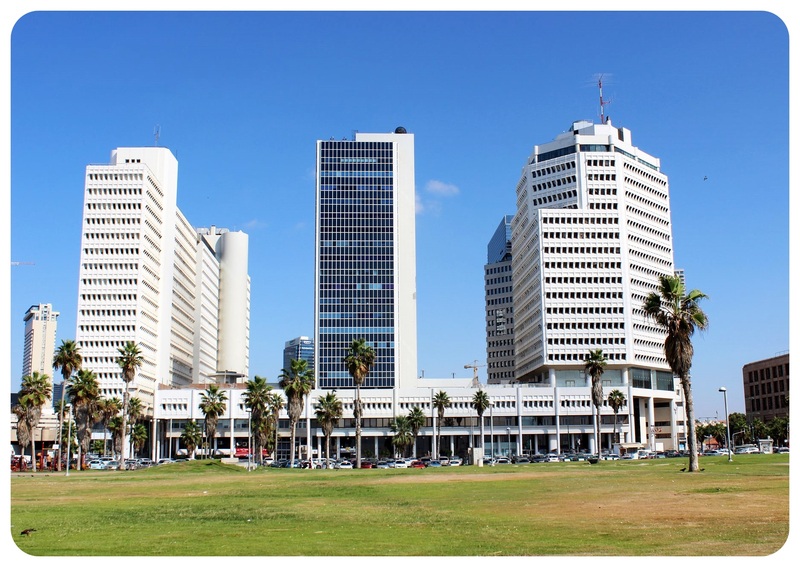 Prior to my visit, I had read that Tel Aviv’s 4,000 white Bauhaus buildings were UNESCO World Heritage, and that the part of the city with the highest concentration was called White City. 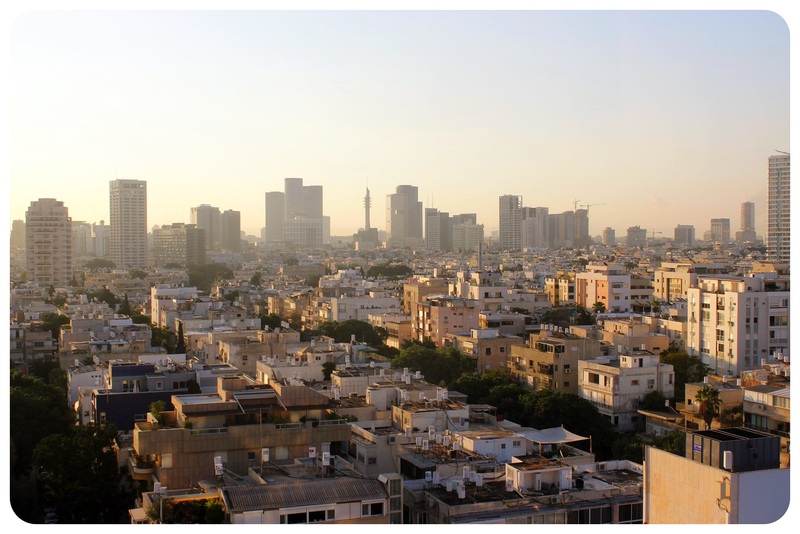 Hence I expected a city filled with grand buildings and stunning architecture – but for the most part, I thought Tel Aviv’s buildings were crumbling and in need of renovation. Which in turn attracts lots of street artists to paint the walls, leave powerful political messages and colorful murals, especially in the Florentine neighborhood. Which isn’t something I mind, I usually find this kind of crumbling glory charming, but it was just not how I had pictured Tel Aviv, so it took me a few days to adjust my senses to my surroundings. (Side note: I also came to the conclusion that Bauhaus is just not for me, despite having grown up 15 miles from Weimar, the birthplace of Bauhaus). And there still are grand buildings in some parts of the city: the Neve Tzedek neighborhood is filled with beautifully restored houses and the villas along Rothschild Boulevard are signs of the prosperity of the city in the early 20th century, but the true showstopper when it comes to eye-catching architecture is Jaffa, the ancient port town that sits on a hill just south of Tel Aviv. 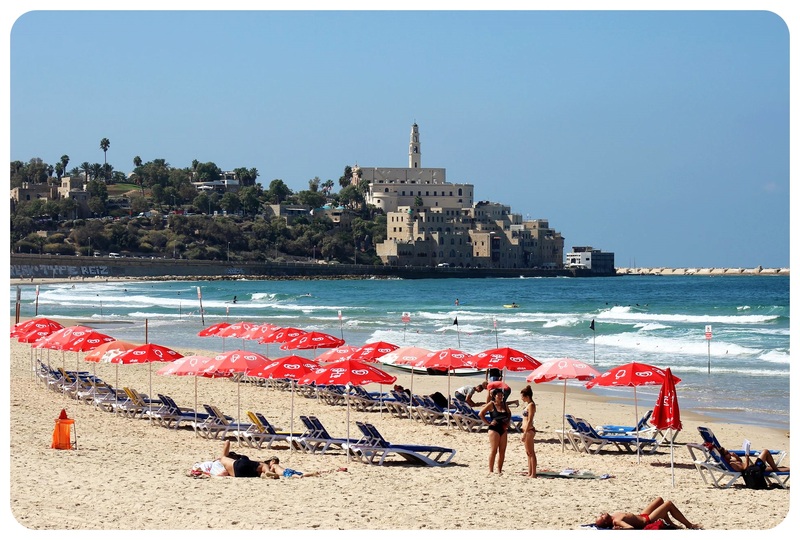 You can walk the beach promenade all the way down to Jaffa and one morning I strolled over there, in time to join the free Jaffa walking tour that starts at the clock tower, and to do some exploring on my own afterwards. 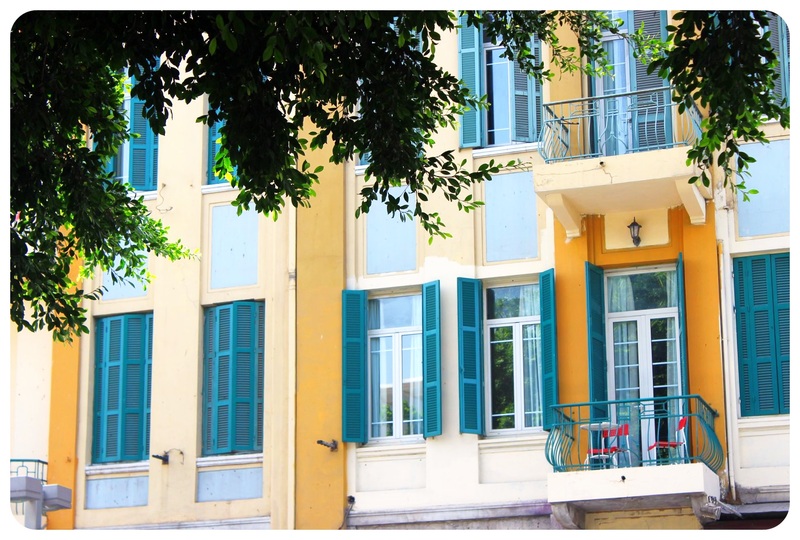 Being a fan of old, quaint buildings, I was immediately enchanted by the restored ocher stone buildings of what was used to be one of the most significant seaports in the region. 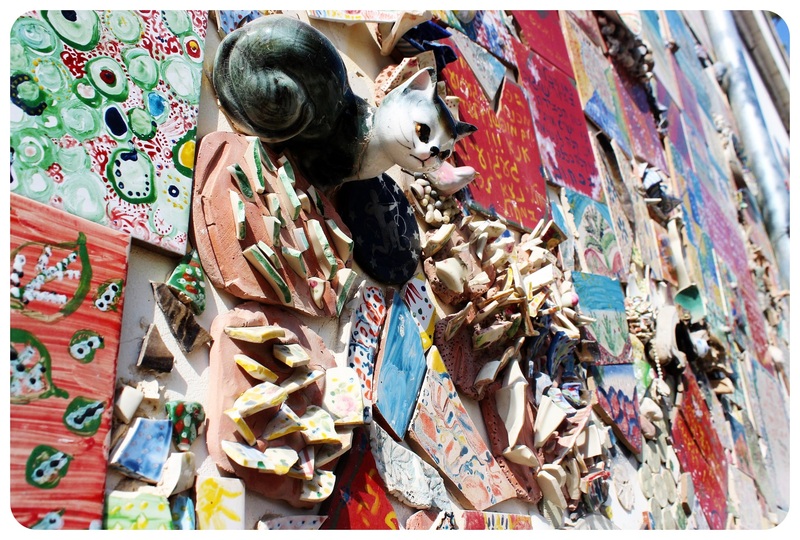 I walked up and down narrow alleyways and stairs and marveled at public art and art galleries, of which there are plenty. 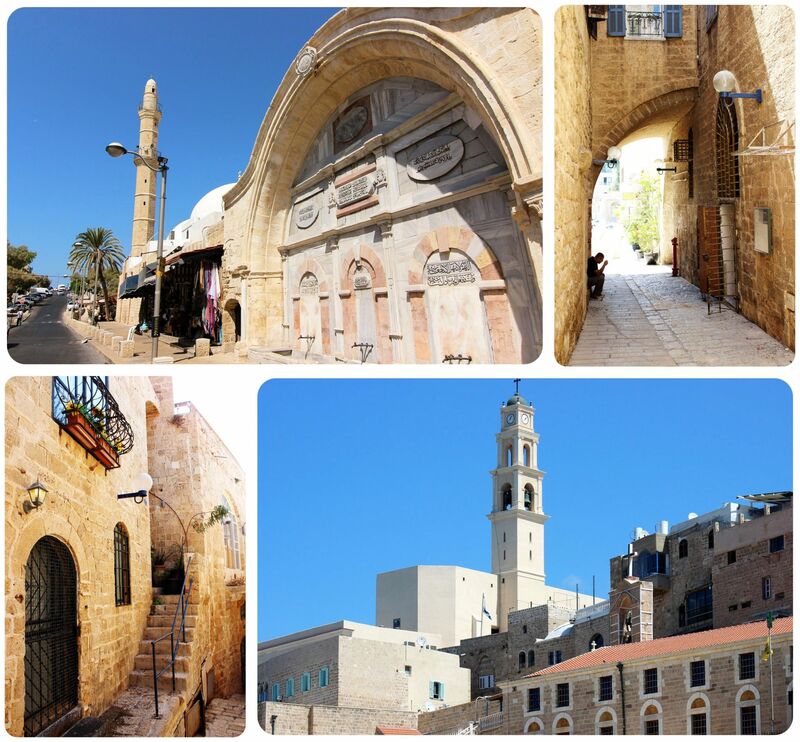 The tour was an excellent introduction to Jaffa, telling us all about the history of the 4,000-year old town that has been experiencing its fair share of ups and downs throughout the centuries, and a wonderful revival ever since its makeover in the past decade. 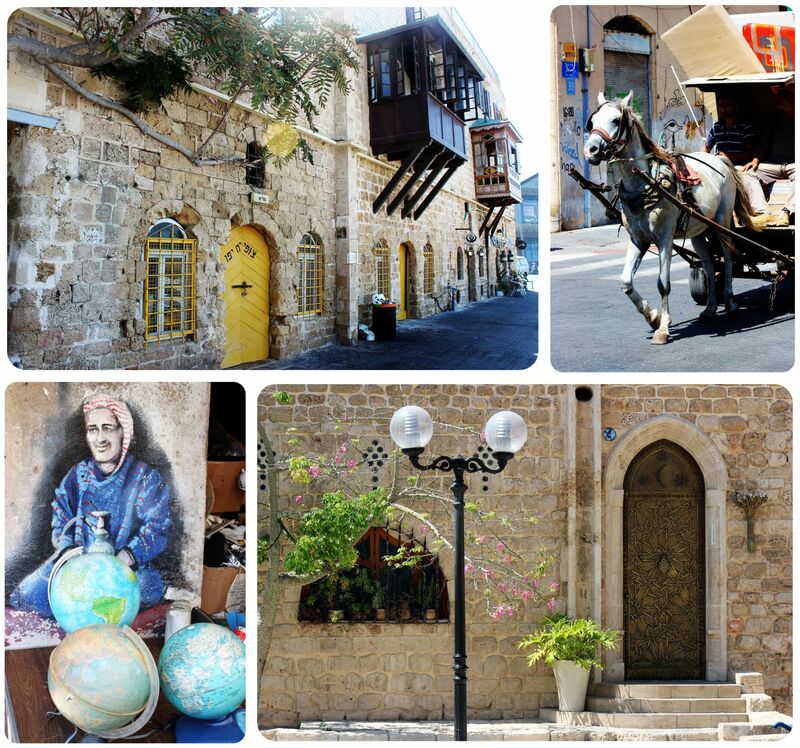 When we finished, I continued to wander the streets, getting lost in the maze of alleys and peeking into some of the galleries, sitting by the fishing boats in Jaffa’s port for a while, standing in awe when locals passed me in horse-drawn carriages which made the ‘stepping back in time‘ feeling I had in Jaffa even more real. Then it was finally time for lunch, for which I had big plans: I was finally going to have Dr Shakshuka’s famous shakshuka. 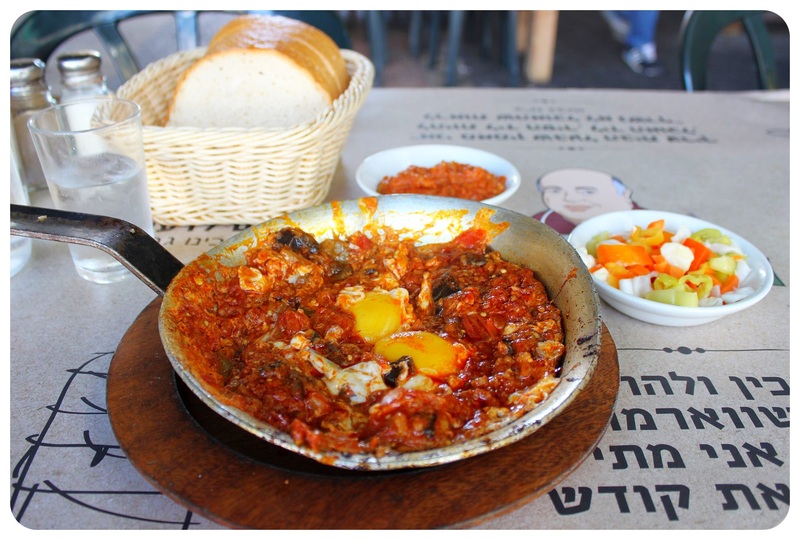 Dr Shakshuka, who started out with a small hole-in-the-wall shakshuka place, has now the most famous shakshuka restaurant in the country, and if you read my article on how I ate my way through Israel, you know that I am pretty much addicted to this popular egg dish. The restaurant is located in the midst of the Jaffna flea market, which isn’t a flea market in the traditional sense but a collection of dozens of antiques shops which line the streets near the clock tower. 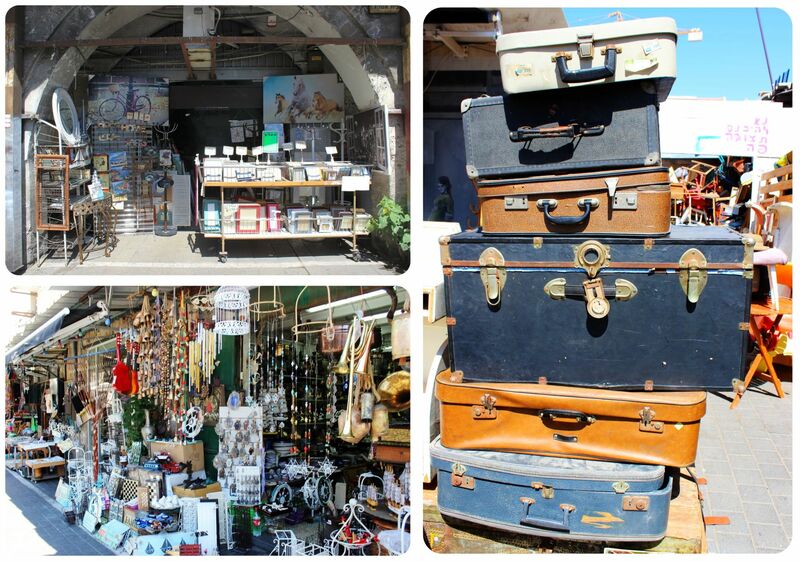 I could have spent hours roaming these shops where you can buy anything from vintage luggage to furniture, books and other bits and pieces. Sadly, Dr Shakshuka didn’t liv up to the hype (at least in my opinion!) 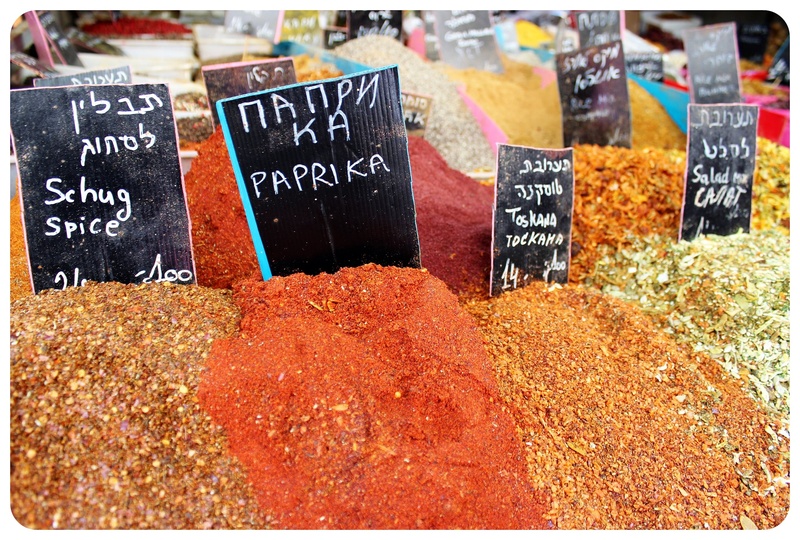 – the shakshuka was good, but I didn’t think it was better than any of the other shakshukas I had in Israel. 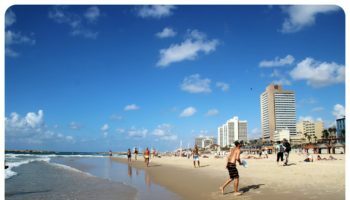 Before I made my way back into the city, I stopped at a viewpoint to take in the vistas over Tel Aviv and its long-stretched shore, and it might have been there and then that I decided I had to come back for longer – a week was simply not enough to get a full grasp of this diverse and forward-thinking city. I am still stunned about how gay-friendly Tel Aviv is, especially considering that this is the Middle East and that Israel is a very religious country – there are only very few places in the world where you can live as ‘out and proud’ as in Tel Aviv, let alone have a Pride parade of epic proportions, attracting a crowd of over 100,000 people (I would love to visit Tel Aviv for Pride which takes place every June). But not only gays and lesbians seem to be widely accepted here, I felt that also the different ethnic groups, in particular Arabs and Jews, were more successful in living peacefully side by side than in Jerusalem for example, known for the regular clashes between the various religious groups who call Jerusalem home. Not only did Tel Aviv seem more liberal than Jerusalem, it also had a younger, more dynamic vibe to it. Jerusalem is home to the largest number of Orthodox Jews in the country which is why it is much stricter with rules regarding nightlife and which places can open during Shabbat (the Jewish day of rest), while Tel Aviv is more relaxed in that respect. The areas of the city that are known for its buzzing cafe scenes, like Shenken Street or Rothschild Boulevard, were always teeming with people, and when I saw trendy 20-somethings in skinny jeans and hipster beards would wait in line for a table at a popular restaurant I felt as if I was in Brooklyn and not in Israel. Speaking of cafes – one thing I loved about Tel Aviv were the bread shops that usually double as a cafe / restaurant and serve some of the best bread I’ve ever had – and that includes bread in Germany! Even regular cafés take pride in their baked goods and I think it is impossible to get bad bread anywhere. Overall, Tel Aviv doesn’t have a dense number of landmarks such as London or Berlin – in fact, other than a few museums and the Bauhaus UNESCO site I didn’t come across any not-to-be-missed sights – and yet I was still completely pulled in by the dynamic atmosphere of this livable city which is far from picture-perfect, but that’s exactly what I came to love about it: the gritty buildings, the street art, the laissez-faire attitude and the laid-back vibe on the beaches. 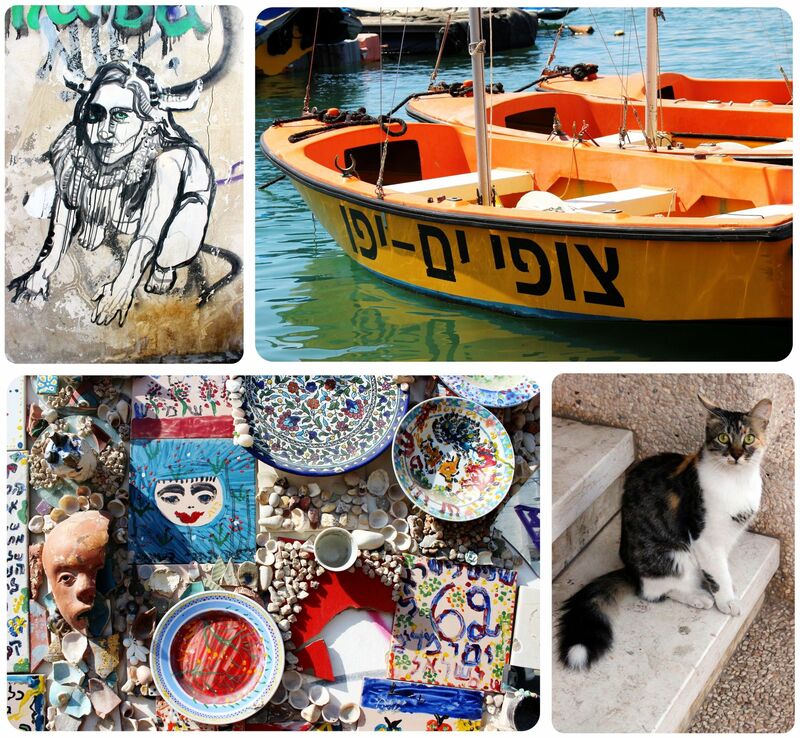 If you come to Tel Aviv, don’t look for striking sights, but let the city pull you in with its strong charisma. Wander, get lost, eat and drink your way around the city, enjoy the nightlife, people watch, take in the local life and fall in love. The free walking tours are a great way to help you get a good overview of the city; there are several ones you can choose from. 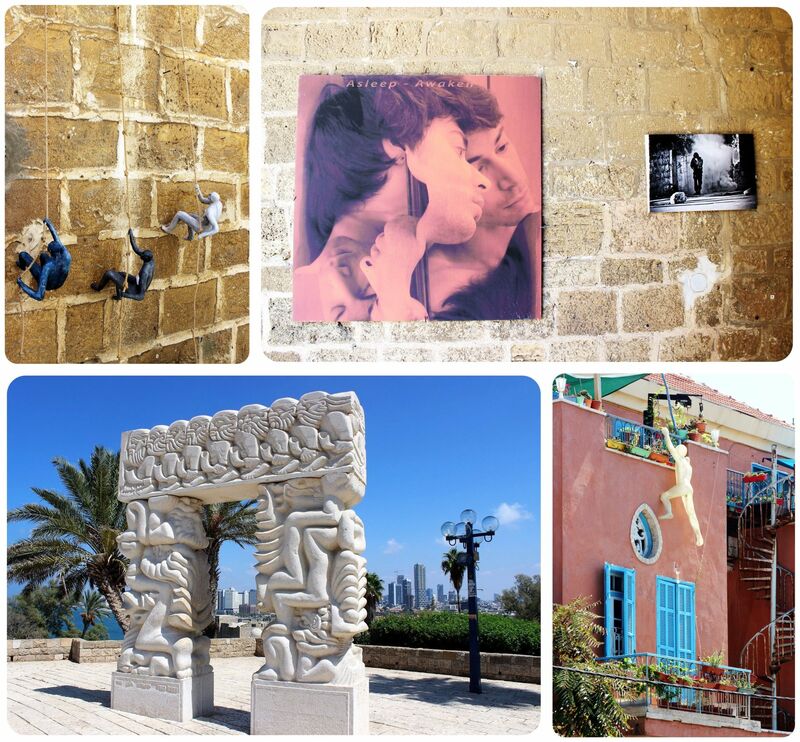 If you don’t have time to go on a free walking tour, check out the Before Tel Aviv was born self-guided walking tour, downloadable on your phone or tablet. 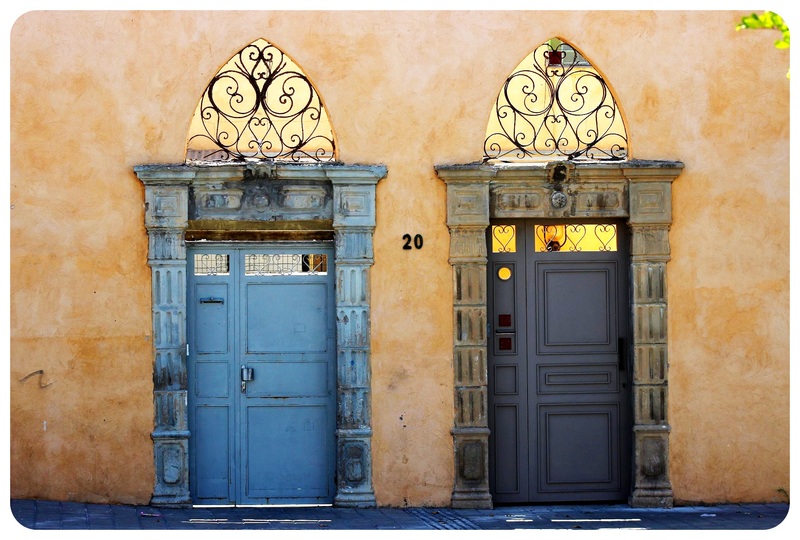 This tour covers the historical neighborhoods of Jaffa, the American-German colony, Neve Tzedek and the old railway station and covers the main parts of Tel Aviv – perfect if you only have a day or two in the city. 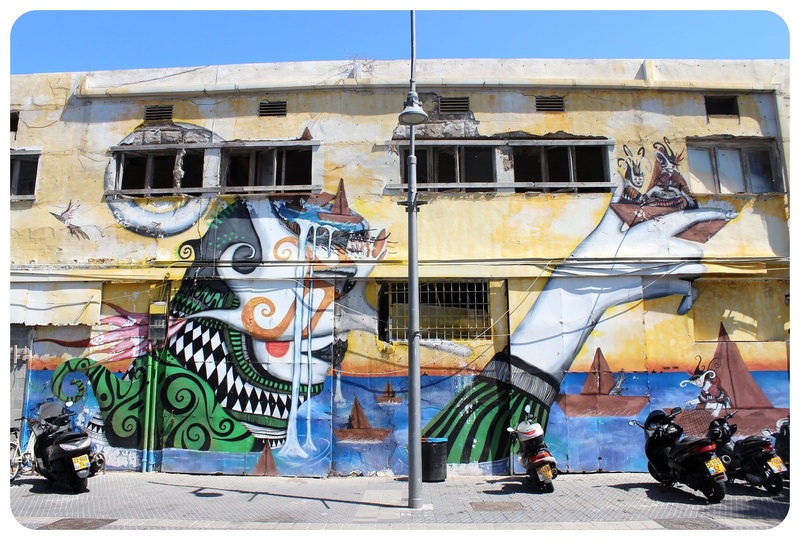 If you love street art as much as I do, you should check out Guy Sharett’s Urban Culture tours. Guy also hosts the awesome Streetwise Hebrew Podcast, which is a great introduction to Hebrew and Israeli culture. I missed the tour because there weren’t any on the days I was in town, but will definitely check it out on my next visit to Tel Aviv. There is no subway system in the city, but I used Google Maps’ Public Transport feature and it always showed me the correct buses to take (you need wi-fi for it but most cafés have wifi). Here is is a good free offline map app with GPS function for Tel Aviv and Jerusalem. I’ve only scratched the surface of the lesbian scene in Tel Aviv, and the popular girls’ bar Gilda sadly closed down in 2015, but here are a few recommendations: the SevenEleven party on Monday nights, the Shabbat dance party at Ismi Salma on Saturdays, Barvaz in the Florentine neighborhood. On Wednesdays it is girls night at Tel Aviv’s iconic gay bar Shpagat. Tel Aviv’s longest standing LGBT bar Evita is also worth a visit. In addition, there’s a number of lesbian parties at changing venues – Facebook is the best way to find out what’s going on while you’re in town. These pages are worth checking for lesbian parties in Tel Aviv: All Stars Girls, Dana Ve Anat, and Pinkhouse TLV for a weekly overview of all gay & lesbian parties. Thank you for sharing your story. I’ve heard amazing stories from friends about Isreal, most of whom took a birthright trip. I’ve always wanted to go and this just increased my wanderlust. It’s great to hear more about the feel of the city and of course, see more photos of the beautiful beaches. Thanks, Megan! When I traveled to Israel I had no idea how much I’d end up loving the country. There’s something about Israel that just pulls you in. I hope I’ll get to go back soon! Thanks so much, Pauline! I think both Israel and Jordan are safe for female travelers. I know several girls who have been to Jordan on their own and they were fine. Israel is definitely safe! And you’re definitely not insane – I was hoping to fit in Jordan when I was in Israel but I ran out of time. It’s still in the top ten of my travel wish list! I LOVE Tel Aviv! I’m going back in June! Great pictures and wonderful text about this great city. 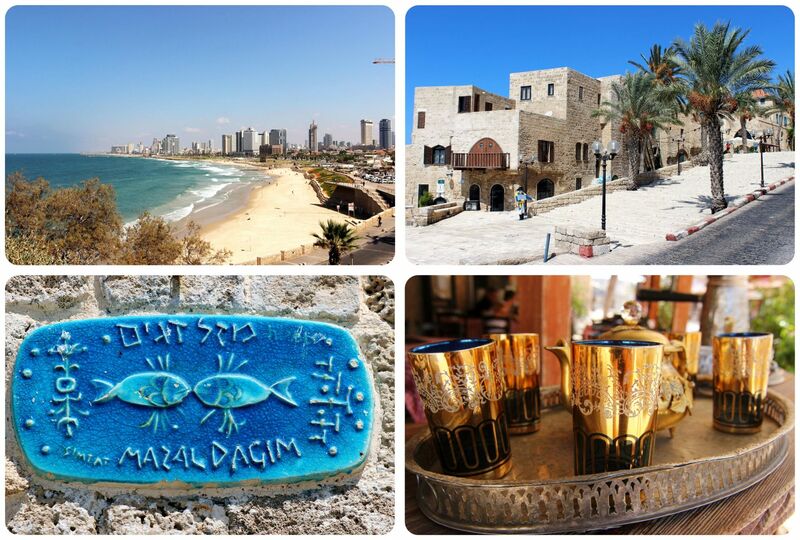 Israel is such a special place and Tel Aviv is my favorite city! I especially enjoy that you highlighted how accepting they are of different cultures and sexual preferences. There’s certainly nowhere else in the Middle East with such loving acceptance of all the cute shirtless gay guys!! I’m not particularly interested in the Middle East but it does look like an interesting place. Gotta love a city by the beach, that’s why Sydney, Cape Town and Vancouver are my favourites! Ahhhh, Tel Aviv!! That city was home to me for the best part of four years, an incredible time in my life… I can’t believe it’s been 16 years since I was there, considering how important it was to me – I know I’ll make it back one day (when India stops pulling me!). 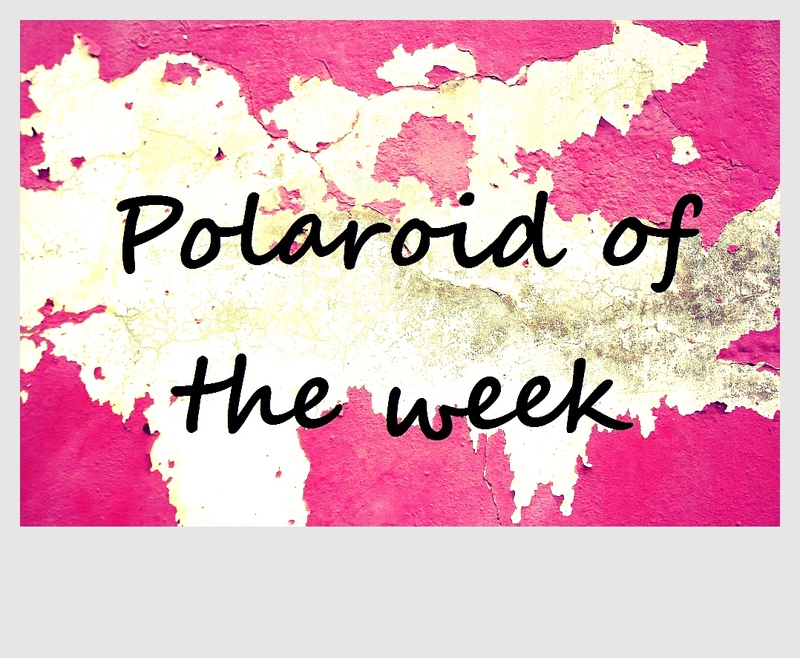 It was really lovely to read your post and see your pictures – it reminded me of my time there and why I loved it so much, so thank you for that – I can see how it’s changed over the years but it still looks so familiar. I am curious how you compare your experience in Jerusalem with respect to Tel Aviv. I felt Jerusalem had a more unique mix of modern day city architecture with old history (i.e. the Old City). One can get that to some extent in Tel Aviv as well, especially in Jaffa, Neve Tsedek, etc. The Mahane Yehuda market in Jerusalem was stunning and seem to have more character & variety than the markets in Tel Aviv. On the flip side, no beaches and sunset in the beach in Jerusalem. Both the cities seemed pedestrian friendly to me. 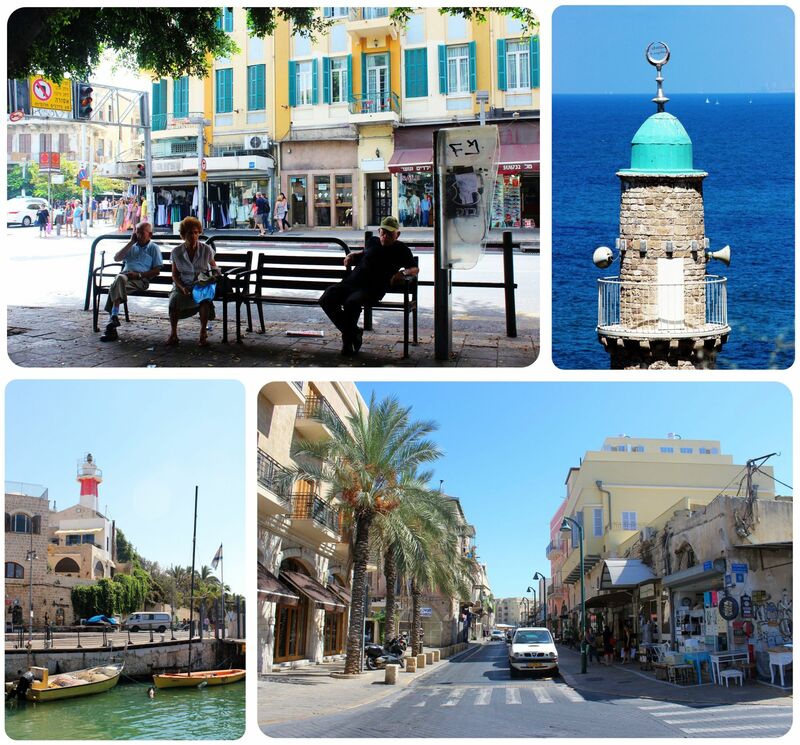 I used to walk to Jaffa from where I lived (1 km from Carmel market). 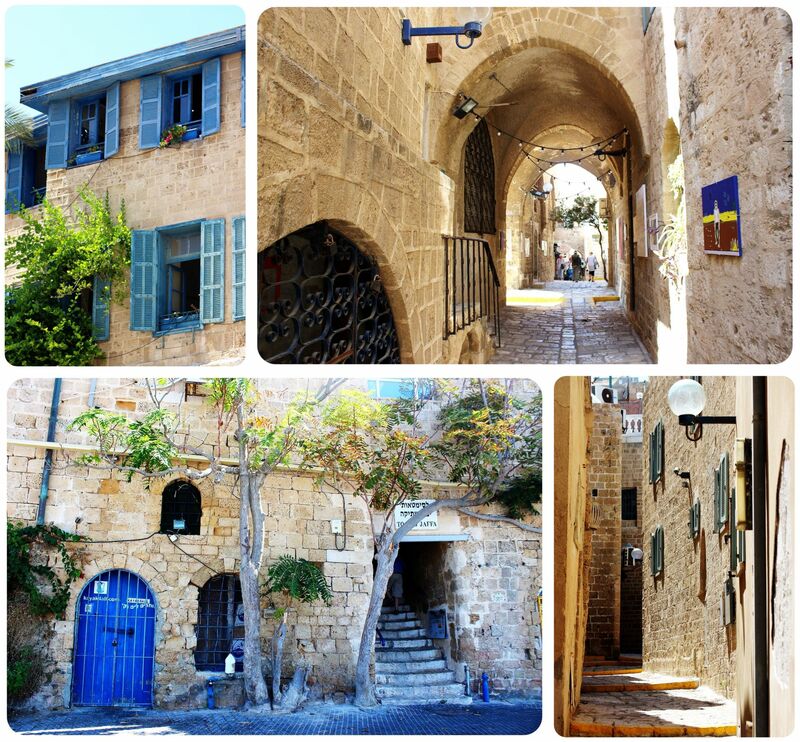 In Jerusalem I had great walks from German Colony to the Old City. I also took the free walk tours in Jaffa, Old City in Jerusalem and some guided walk tours in Mt Olive, etc and the guides were excellent! 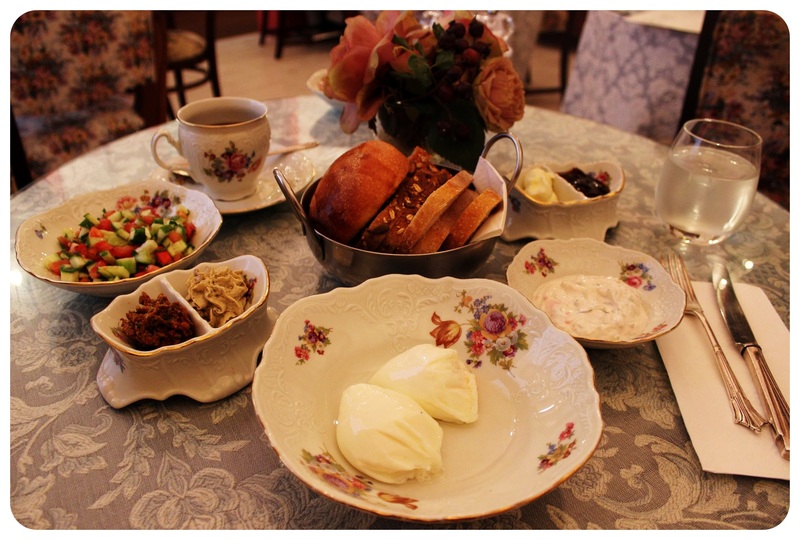 I felt there were more cafes in Tel Aviv, but both Tel Aviv & Jerusalem had good breakfast/brunch places. Do you have any favourite hummus place in Tel Aviv and/or Jerusalem? Overall, I have been just blown away by Israel and can’t wait to visit again. 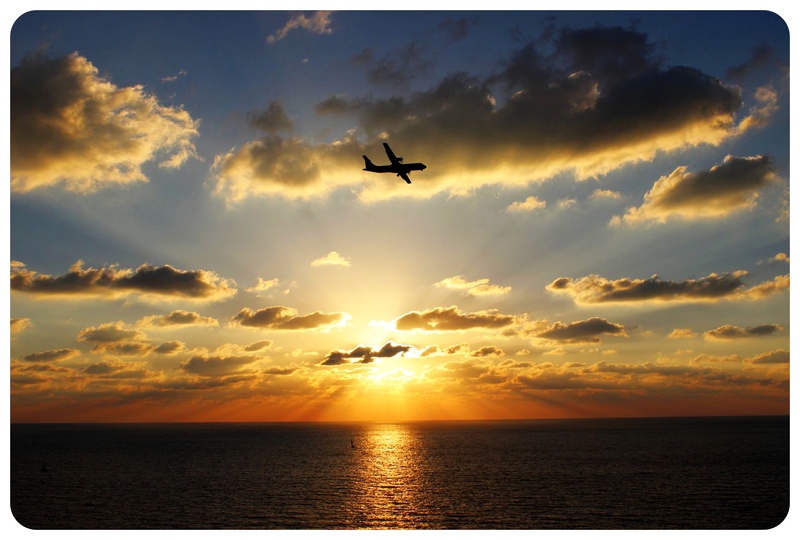 Next time I want to see the sunrise in Masada which I think you did during your trip! Sorry for probably writing a bit off topic from Tel Aviv; am just reliving my wonderful memories through your posts! P.S. Yes I did see the sunrise from the Masada and I highly recommend it! Absolutely stunning. I know that hummus place which I think is also called Abu Hassan. It was too crowded all the time I was there! Did you try or see the “Blackout Restaurant” in Jaffa: http://www.telavivnet.com/restaurants/blackout/. I thought it was unique even though I didn’t dine there and one needs to book way ahead of time. A Georgian vegetarian/vegan eatery in Tel Aviv that I found interesting was Nanuchka (http://nanuchka-tlv.com/). Thanks for sharing your Israel experience! I moved to Tel Aviv 2 weeks ago from Berlin. High rents, great food but everywhere I go where people live it smells of catshit. The locals don’t notice but I do. 2nd, motorcycles on the sidewalks, I got hit pretty hard on my 3rd day, almost knocked me over. People call them electric bikes but that is a misnomer, that are electric motorcycles that go 40 to 50 kph on the sidewalks and are really quiet. The cops say nothing and on Tuesday I saw an elderly women get hit, went to the ground and the lady on the motorcycle kept going. She may be old but that is someones Mama, sister, daughter. On the ground I noticed one leg was shorter then the other, a sign of a broken hip. She was in so much pain. It will take a baby to get killed to wake up the Police to the problem. 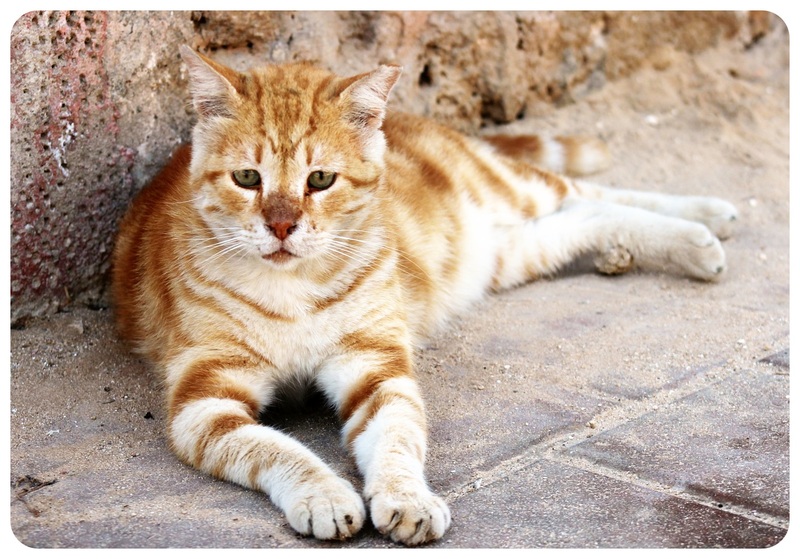 Otherwise, Tel Aviv is a fine city overloaded with wild cats and mototcycles on the sidewalks. Sounds interesting, will consider adding Israel to our bucket list! Thanks for sharing. 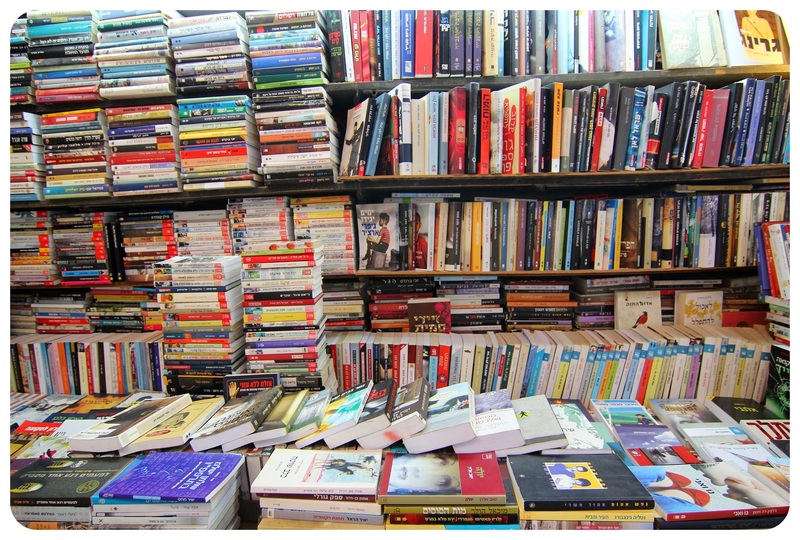 as a Tel Avivian man, i really enjoyed to read, and i happy you enjoyed our city. By the way, i think israel less religious cuntry then you think.